your website for ARROW® AutoCAT 2 WAVE® IABP education. We provide educational videos to learn and review the operation and functionality of our revolutionary IABP system. 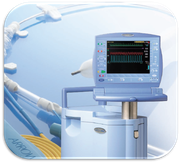 Short skill videos reviews steps needed to prepare ARROW® IAB catheter and operate ARROW® IABP consoles. Our comprehensive videos provide reviews of IAB catheter insertion in the clinical environment, confirmation of proper IAB catheter placement and IABP console start-up. Teleflex is a leading global provider of specialty medical devices used for diagnostic and therapeutic procedures in critical care, urology and surgery. Our mission is to provide solutions that enable healthcare providers to improve outcomes and enhance patient and provider safety. We specialise in devices for general and regional anaesthesia, cardiac care, respiratory care, urology, vascular access and surgery and we serve healthcare providers in more than 130 countries. Teleflex also provides specialty products for medical device manufacturers. Teleflex global operations: Austria, Belgium, Canada, China, Czech Republic, France, Germany, Greece, India, Ireland, Italy, Japan, Mexico, Netherlands, Portugal, Singapore, Slovak Republic, South Africa, Spain, Switzerland, United Kingdom, Uruguay and USA. Headquartered in Massachusetts, the Cardiac Care division engineers, develops, manufactures, sells and supports technologically advanced left heart products for critically ill cardiac patients. Additionally, the Cardiac Care group manages and sells a line of right heart catheters as well as angiographic diagnostic catheters and cath lab focused kink-resistant sheath products.